The Toy Maker, this Norman Rockwell painting, appeared on the cover of The Literary Digest published November 20, 1920. The alternate title for this work is Commuter Rush. This illustration was Rockwell's twentieth picture featured on the cover of The Literary Digest. 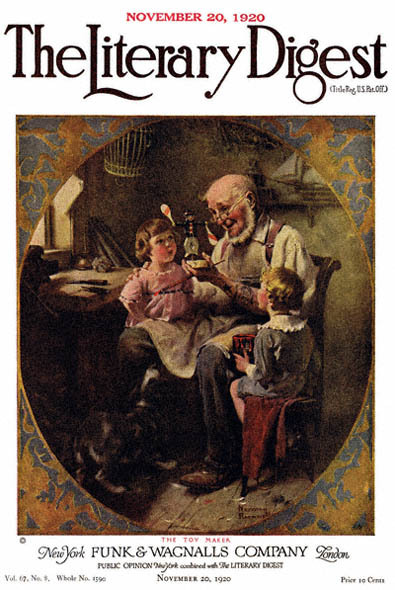 Rockwell artwork was featured on the cover of The Digest nine times just in 1920 alone. The original oil on canvas painting, 28 x 24 inches or 71 x 61 cm, is part of a private collection. Norman Rockwell takes us into the world of making toys in this illustration. Of course, anyone who likes painting children as much as Rockwell could hardly resist this topic. The Toy Maker was only one of 47 Norman Rockwell Literary Digest covers; here is the list of more Norman Rockwell Literary Digest scans. This issue was published just before the Christmas season. Retailers had not lengthened the Christmas season into two and a half months in the 1920's. The toy maker has just finished another toy in this painting. The paint on the toy isn't even dry yet. He still holds the paint brush in one hand. His helper, the young boy, holds the paint can for him. The amazed look on the little girl's face and the stance of the dog confirm that this toy is indeed moving. The red and white bowling pins attached to his hands are most likely spinning around. His carving tools are one the table. Red and white paint splotches are on the floor. Satisfaction covers the kindly old toy maker's face. The little girls contentment is all the gratification he needs.